04:53 – Butler Ahn is so thoughtful, giving Yi Suk a warning and telling him that he needs to ask forgiveness etc. Butler Ahn and Psychiatrist Uhm are good parental figures. 07:50 – This conversation went better than I expected! This family is so wonderful! I love how Yi Suk understands Hong Do’s actions and the grandfather isn’t far behind. I think he’ll need time to fully come round because of the shock. Oh my gosh this is too cute! He came back to sort her coat epaulette thingys. Se Ro is starting to creep into his heart I know it!! I love the grandfather, this comeback is wonderful. 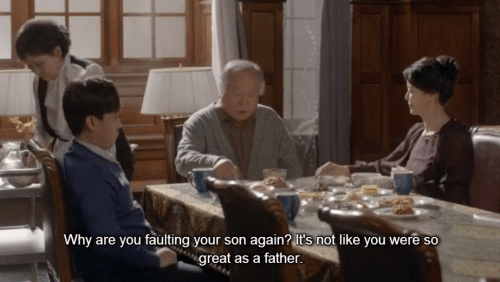 How does Yi Suk’s father not understand that this is the truth and he shouldn’t feel so sorry for himself. 11:40 – The woman who like the grandfather has finally had it! And the grandfather is so confused, bless him! 13:18 – Yay!! Se Ro go the role and they even changed it from a male character to a female one for her because she was good. Her perseverance is so inspiring! 17:50 – Det. Jang got pushed down the stairs… he better be okay, but if he needs to be nursed back to health, Se Ro is more than willing! 19:10 – Yi Suk’s family is so cute!! His mother is adorable and looks so happy and is being so sweet to Hong Do~ I love it when the mothers and female relatives of the male lead are actually nice! 22:45 – I’m really not having a good feeling about this… but the little girl in the beginning… they didn’t call her Hong Do. 28:22 – The grandmother changed Hong Do’s name… does that mean she set the fire?? and the grandfather gave HD’s grandmother money for her to leave (I’m guessing)… please don’t do this to me drama!! 35:28 – Looks like makeover time!!! 36:33 – That little scene was cute. I’m also glad that her style hasn’t really changed and Yi Suk doesn’t force her to change it, Hong Do is still Hong Do and she is happy with the way she dresses. 36:54 – Grandfather!! Really? You called her ‘this thing’… ugh bad form mister. Yi Suk you precious flower let me love you!!! 42:00 – Yi Suk’s mother is so sweet, I want to just hug her! I know she doesn’t know the whole truth and something is coming which may make her feelings change towards Hong Do. But right now, she is just a mother who is happy that her son isn’t struggling with his life and is in love, even if the woman isn’t up to their ‘standards’. Pahahaha why is he sleeping next to him?? I he his mother or something :p I love this partnership/friendship. 56:40 – IS HE TELLING THE TRUTH?!?!?! Yi Suk and Hong Do living in her house… I didn’t know I needed this!! That place is so small and they would be so cute and I think that this may not happen (yet – I can hope) because grandfather does not sound happy. Yi Suk even mentioned thinking about marriage… I think I need to lie down. 56:50 – He’s ‘running away’. How old is Yi Suk? It’s kind of sweet though, he’s standing up to his grandfather, but also doesn’t want to hurt his feelings. 58:41 – I don’t like this. I really don’t like this. Please let this not be how things went down!! And I don’t think Yi Suk’s mother is going to be on her side anymore. 59:03 – Why would you just tell her out straight something like that. The woman has bi polar and she doesn’t deal well with anything concerning her dead son.